Imagine you could ride anywhere in Europe, where would you go? It’s a nice thought experiment, perhaps begin by picking a preferred region and then think of some special roads and extrapolate this into the best part of a day’s ride. That’s the genesis of this book, a collection of 25 rides that are illustrated by lavish photos, route maps and plenty of detail on each of the proposed courses. The Tour de France is over a century old but these days a lot of the action, novelty and money is with sportives, cyclos and gran fondos. Call them what you like, these mass participation events are typically long distance rides over challenging terrain made famous by the mythology of professional races. While amateurs have been riding long distances well before the professional sport emerged began, the concept of the “sportive” took off in the 1980s with La Marmotte, an event in the French Alps where participants paid, and still pay, to take part on a tough loop including the Galibier pass before the Alpe d’Huez summit finish. The scene is thriving and what was a Franco-Italian matter is now booming in Britain, expanding in the US. To go full circle the Tour de France owners ASO are promoting branded “Etape” events around the world. 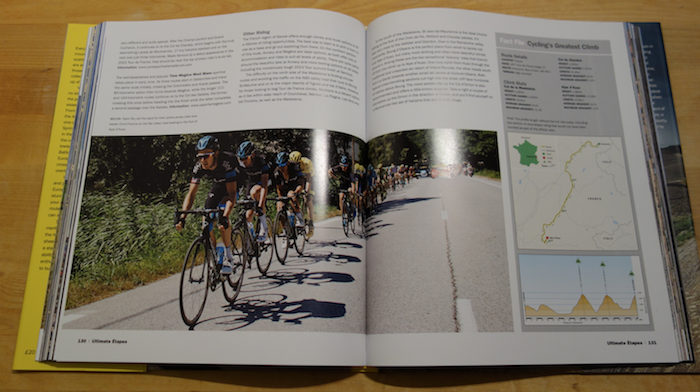 In this book Peter Cossins presents 25 stages of a fantasy cycle Tour of Europe, a collection of 25 suggested routes. All are linked to a pro race whether an established event like Paris-Roubaix or a route used once during a stage race, such as a stage of the 1977 Tour de France from Chamonix to Alpe d’Huez. The format sees each of these stages described in detail with accompanying big photos to show you the lie of the land, sometimes the image takes over two pages and gives this book that “coffee table” feel. Each route is accompanied “Sportive” and “Other Riding” sections which suggest events to do and roads to ride. 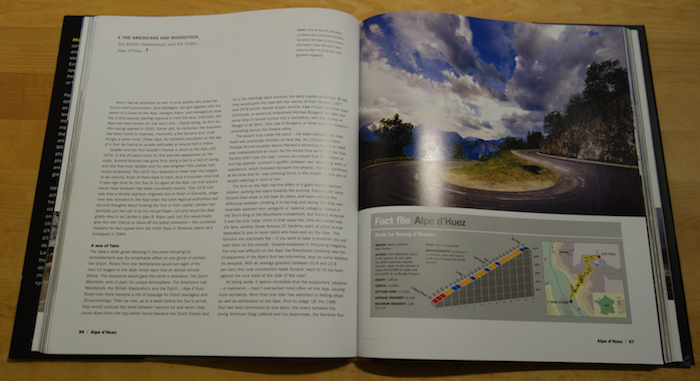 There’s also a fact box with the route details, map, profile and the climbing stats for any ascensions along the way. The pictures are tempting, many are by Ashley and Jered Gruber and show the cyclist as a detail amid the landscape. Once on the main N7 road west, the going is quick. Bypassing Leuze-en-Hainaut, the route heads towards Tournai, but turns south a few kilometres before reaching this town towards Barry, Baugnies and Wasmes-Audemez. After crossing the A16 autoroute, the route follows the N503 through Péronnes to the second section of pavé at Hollain soon after traversing the river Escaut (Scheldt). At 1,200 metres in length it’s much more in the mould of Roubaix’s sectors, even more so because the next parcel of pavé arrives three kilometres later at Rogny. Exiting it, the route skips over the border without a pause. That’s just one of nine paragraphs detailing the stage route. This was a flaw in the book: all these navigational prompts make a dull read yet there’s too little information to help you trace the actual route. Helpfully all 25 routes are available to download from two mapping websites, bikemap.net and mapmyride.com so you can print route sheets or download them to a GPS device. The text is not just directions, there are tips to how to ride on the pavé to local information such as the history behind the Teufelsbrücke (“Devil’s Bridge”) in Switzerland, a warning that a the road could be damp during wooded descent and, on the Corsican stage, details of bakery in case you need to stop for food. But a lot of the route description is procedural and the more interesting snippets are tucked inside text you might skim. The routes may seem prescriptive, the writing primarily about following a set course from start to finish but it pays to treat them as an invitation to explore rather than follow. By all means tackle the beautiful 171km ride across Switzerland from Bellinzona to Grindelwald but either you’re riding back to the start on a self-imposed ultra ride; or you’re carrying sufficient spares and supplies for a night or two away; or you have someone to drop you at the start and collect you at the finish. Or you’re reading this as escapism, with the winter evenings here is a chance to imagine yourself cresting mountain passes or pedalling past scenic lakes decorated by blooming flowers. Each route is possible but chances are you’ll take inspiration and information from this book and do some of the route during a visit to the region, perhaps enter a ride listed in the “Sportives” section for the weekend and dedicate some of the weekdays to places suggested in the “Other Riding” part. Viewed this way a single stage can be extrapolated into a week-long holiday of riding. It’s reminiscent of Daniel Friebe’s Mountain High and Mountain Higher books. In fact the format seemed so identical I wondered if Ultimate Etapes was related, the third in a series? Superficially the cover is similar, it’s the same size and the big landscape photo and yellow spine makes it look more alike. Open the pages and the fonts appear identical, ditto the page layout and even the grey “Fact File” boxes resemble each other too much to be a coincidence. Publishers Quarto have nothing to do with Mountain High’s publisher Quercus. But the visual similarity can’t be an accident and reading the smallprint credits at the back the layout was designed by a London agency called The Urban Ant and sure enough they did Mountain High too. The clear style works well in both books and Ultimate Stages is a standalone effort and not part of some cyclesport travel trilogy. Unlike Mountain High not all the routes celebrate the vertical. There are plenty of mountain stages of course as they’re such a draw and offer scenery and sport alike but fewer than half are what we’d call mountain stages in a grand tour, there are several few flat routes like the Tro Bro Leon tribute or the Vattenfall Cyclassics too. There are a few typos and hiccups in there too. There’s a lament that the Strade Bianche race isn’t in the UCI World Tour only it’s just been added, presumably the print deadline was to blame. A route called “The Tour’s First Climb” offers a fine ride in the Vosges to celebrate the Tour de France’s visit in 1905 but the first mountain pass in the Tour was probably the Col du Pin-Bouchain in the Massif Central in 1903 and certainly the important Col de la République featured that year too. The Verdict: want a challenging ride somewhere in the Europe? If so then this might give you ideas, tips and route. Don’t want to ride in Europe? This book may change your mind with its attractive and plentiful photos and the variety of routes. Even those who’ve aced the Alps, pedalled the Pyrenees, rumbled to Roubaix and vanquished Ventoux should find new ideas here with suggestions like the Cinque Terre in Italy or Switzerland’s Grosse Scheidegg. Comparisons with Mountain High seem inevitable, for starters because of the curious copycat design but they’re distinct efforts. 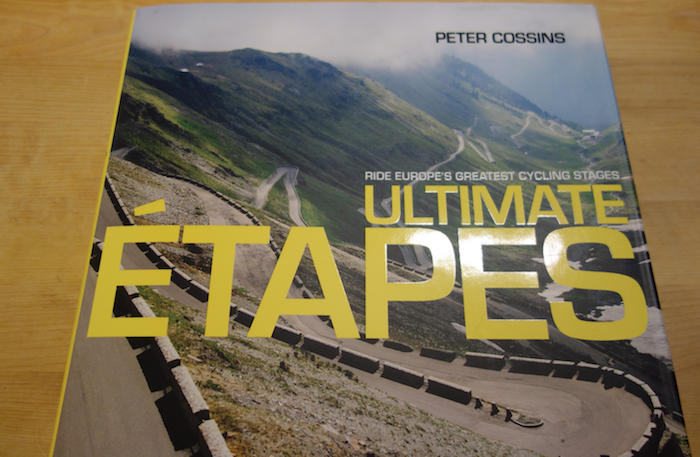 Ultimate Etapes offers some flatter routes which some will cherish but as a book it also supplies flatter prose, the lengthy route descriptions give you the turns but not always the twists. Fortunately the book is much more than navigation instructions with the extra detail and inviting photos which should help hatch those plans for next summer. Note: a copy of this book was sent for review. Ultimate Etapes is published by Quarto-Aurum and the sleeve quotes a price of £20 / US$29.99 / CAN$38.99. Inrng – Many thanks for taking my mind off yet another UCI/ASO kerfuffle. 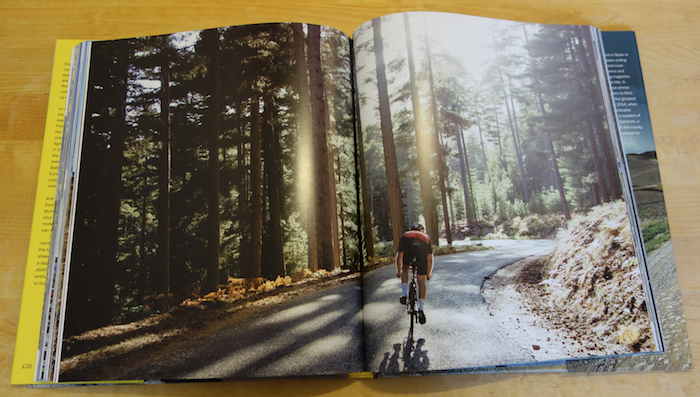 This book (and the routes) looks like a great way to spend a day. I wish I could head to a coffee shop right now and get into this book. Of the two books, which one to buy? I want one for my library, but not both. Hi Dave…. well as I said in my “review” I have all 3 but to be honest they´re both (the Friebe and Cossins volumes) the “same” yet slightly different. Friebe´s are obviously more mountain focused, whilst Cousins might be more useful for someone planning a ride in a particular area. Freibe´s are marginally a nicer read, but both are visually pretty similar which is not a bad thing as they are both very good. ….that doesn´t really help you does it!? It’s going to be a matter of taste, ideally find a good book shop and compare them to see what you prefer. 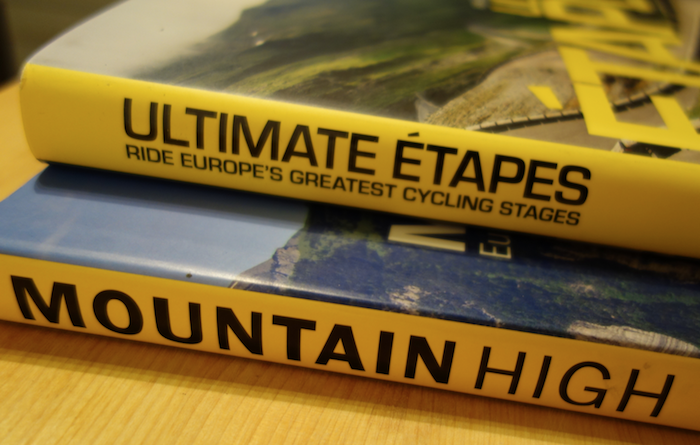 As suggested above Ultimate Etapes has more about routes and riding around Europe including some flatter courses while Mountain Higher is about climbs and, subjectively, feels more readable with less navigation and more storytelling about the history of its climbs. Yes, I also have this book and Mr. Inring is right in that you´d really have to have both a lot of time on your hands and be very fit and strong to use it as a guide in following the routes themselves, primarily because all the routes are point to point. A few could be done “bike packing” and back to back maybe, but to me at least, the real opportunity for a book similar to this is one for very keen riders in the 150+ km length with the nice photos etc but based on rides that are actually “realistic” and “doable” and a little bit “not the ordinary”.Ok, it´s kind of a “Where do you start” subject but it would be nice to have some less well known areas covered and not just the usual jaunt up the Alpe that´s been done a thousand times before. Where the book is more useful is in finding out alternatives and other possibilities, like those mentioned as alternatives or in a similar geographical area to Tro Bro (La Bernard Hinault or La Mordihannaise Jean Floc´h Cyclosportive) It´s also a bit of a shame he didn´t mention either of the series of Belgian sportives run in the spring and summer, namely the Proximus Challenge and the Sport.de DVV series…..these are relatively unknown to a lot of English speaking riders and are often a “better” alternative to say the Ronde or Amstel Sportives. (The La Chouffe ride for example was possibly the nicest ride I did last year in a region not so frequented by a large sumber of Sportives as say Flanders. I´ve also got rides like La Phillipe Gilbert, Sean Kelly Classic and Cyclosportive Criquielion on the bucket list). Don´t get me wrong, these large events like De Ronde are great fun events, especially when combined with watching the real race, but to be honest if you really want to “ride” the course or bergs of De Ronde, with 14 or 16 thousand other riders out there it´s often best to pull your head in and just ride it as a tourist as getting up the Koppenberg for example can be reduced to a lottery (especially since the organisation moved one of the feed stops to just a couple of km´s away thereby creating a natural bottleneck at the climb). Completely agree with the statement regarding the similarity to Daniel Friebe´s books…I have both of those as well, and when I first spotted this in a shop I thought I´d missed another volume until I checked the authors name on the cover. As for Mr Inring´s biggest “klanger” of the year?? – “Don´t want to ride in Europe”??? :-O ….are you out of you´re mind!????? ?….if anyone out there doesn´t want to at least dream or “want” to ride in Europe, I´d say they´re following the wrong sport surely!? 😉 ….. love your work really, Cheers!! The Urban Ant got paid twice for one job. Nice work if you can get it.